From July 14 to 16, 2000, the surface of the sun exploded. Huge, bright flares spewed out into space like powerful fountains colorfully lit from beneath. 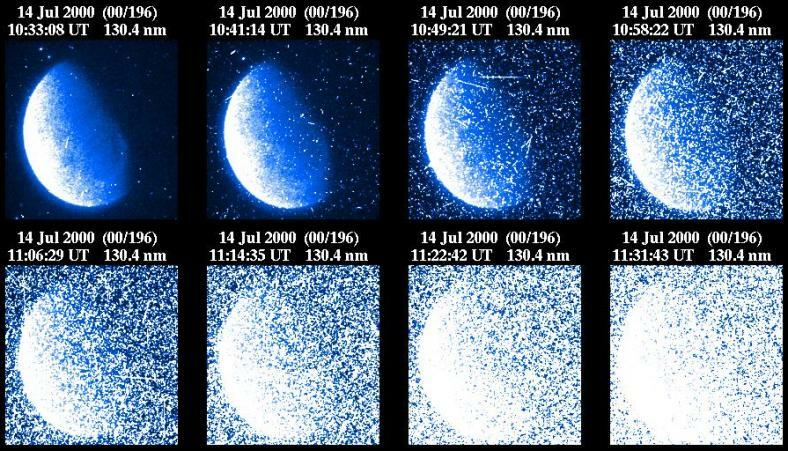 Within a few hours, the solar storm bombarded Earth with a shower of positively-charged hydrogen atoms, called protons, causing scientific and communications satellites to short-circuit. Through a series of chemical reactions in our atmosphere, the protons drastically diminished the upper-most areas of the ozone layer, a protective blanket mostly in the stratosphere that blocks life-threatening ultraviolet radiation from reaching the Earth. This shower of protons, known by solar science insiders as the Bastille Day event, was the third largest of its kind in the last 30 years. Atmospheric scientist Charles Jackman and a team of researchers from NASA’s Goddard Space Flight Center and Hampton University in Virginia recognized a rare opportunity to gather further proof that solar storms destroy ozone. They already knew that when protons bombard the upper atmosphere, they break up molecules of gases like nitrogen and water vapor. Once freed, those products readily react with ozone molecules and reduce the ozone layer. So, Jackman and his colleagues recalled specific Northern Hemisphere atmospheric data from NASA and National Oceanic and Atmospheric Administration (NOAA) satellites that continuously monitor the composition of gases and molecules that surround our planet. Their findings, published in the August 1, 2001, issue of Geophysical Research Letters, show that less than one percent of total atmospheric ozone in the Northern Hemisphere can be quickly reduced by one of these events. “It is an indication of the power of the sun to actually affect the atmosphere in a sudden, cataclysmic way,” Jackman says. While the results do not show a significant impact on human health, especially considering that most of the ozone loss documented in this study occurs over the northern polar region, they are important scientifically. The study gives detailed and quantified knowledge of how a solar storm affects upper-level ozone. As scientists race to better understand humankind’s role in ozone loss, they must first be able to tease out the natural causes. Jackman explains that ultraviolet radiation from the sun continuously strikes the upper atmosphere. These harmful ultraviolet rays would make life on Earth impossible if it weren’t for the ozone layer that absorbs the radiation. Ozone forms when three atoms of oxygen bind together to create a single molecule (O3), but when ozone absorbs ultraviolet radiation, the molecules split apart into a single free oxygen atom, and an oxygen molecule of two tightly bound oxygen atoms (O2). O2 is the oxygen we breathe, and it makes up about 21 percent of the Earth’s air. “The free oxygen atom is so reactive and there is so much O2 around, that out of 1001 times that this reaction occurs, 1000 times it will reform,” Jackman says. As a result, day-to-day break down of ozone by ultraviolet radiation doesn’t affect the overall amount of it in the atmosphere.“The only way to destroy ozone is for that free atom of oxygen to reform with something else,” Jackman says. That’s where solar proton events enter the picture. When protons from the sun hit the atmosphere they break apart both water vapor and nitrogen gas, which accounts for 78 percent of our atmosphere. The nitrogen gas molecules (N2) disconnect and leave two free nitrogen atoms. Nitrogen atoms are highly reactive with O2, creating oxides of nitrogen. Once formed, these molecules can last for weeks to months depending on where they end up in the atmosphere before they get destroyed. Protons also break up water vapor (H20) into a hydroxide molecule (OH) and a free-floating single atom of hydrogen. Both of these products also react easily with ozone and reduce its levels in the atmosphere. Fortunately, oxides of hydrogen are short-lived and only stay together as long as the rain of protons keeps coming. The atmosphere’s layers include the troposphere, the stratosphere, the mesosphere and the thermosphere. The troposphere lies closest to Earth at zero to nine miles up, and the thermosphere floats furthest away at about 60 miles up. Ozone is distributed over these layers. About 90 percent lies within the stratosphere, and most of that amount-over 80 percent of the total ozone-stays in the middle and lower stratospheric regions. Around 9 percent can be found in the troposphere, and the remaining one percent sits in the mesosphere. By observing the Bastille Day solar event, Jackman and his colleagues found that the short-term effects of hydrogen oxides destroyed up to 70 percent of the ozone in the middle mesosphere. “The mesosphere was really shaken,” Jackman says. At the same time, ozone loss caused by longer-term nitrogen oxides cut out close to nine percent of the ozone in the upper stratosphere. But, Jackman says, only a few percent of total ozone resides in the mesosphere and upper stratosphere. “If you look at the total atmospheric column, from your head on up to the top of the atmosphere, this solar proton event depleted less than one percent of the total ozone in the Northern Hemisphere,”Jackman said. While that doesn’t sound like a lot, scientifically speaking the numbers for the specific atmospheric regions are quite significant.